Pinning can be addictive. This is a great opportunity to market your brand. Many pinners admit to spending hours pinning and finding items to like and repin. From a brand perspective, it may not look or feel like marketing because you’re not doing something like creating eye-catching headlines. You will still need a way with words for your descriptions. It’s just that instead of those attention-grabbing headlines, you’re capturing the attention of the Pinterest community with images and videos. That’s why your content has to be appealing and colorful, and it needs to make folks want to learn more. Pinterest is a huge traffic driver. Funny and vivid images can capture the attention of thousands of people. To start, go ahead and pin something. To pin something, click the Add+ link located on the top-right of your page. 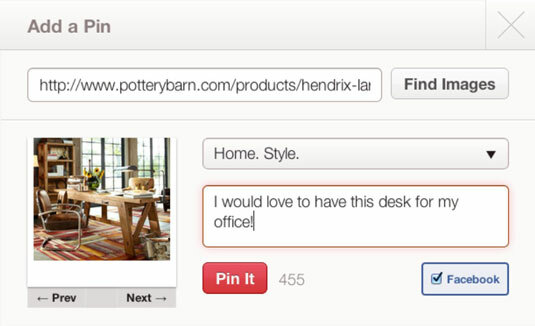 You see a box pop up with three options: Add a Pin, Upload a Pin, and Create a Board. A dialog box with a space for a URL appears. Enter the URL of the item you want to pin (for example, an item you’d like to purchase) and then click Find Images. Pinterest automatically pulls images from the website and displays them in the image box on the left side. Click the arrow to cycle through the images to choose the one you want to pin. Make sure you select a photo that’s eye-catching and properly showcases what you’re trying to show. Select the board you want to pin to, or create an appropriate board. Create a description of up to 500 characters. Click the Pin It button at the bottom. Your pin now appears in the feed on your main page as well as on the feeds of everyone who follows that particular board. Some websites and blogs have blocked the ability to download or share their images because they don’t want them reposted on Pinterest. If you have come across a photo that has sharing disabled, seek permission before pinning the image. The last thing you want is to be in copyright violation.